Applications: FMCA combination brushes are designed specifically to fit Finimaster I or PTX type machines (with 19mm shaft) and are suitable for light coating removal, scratch removal and re-graining. They are best used after an abrasive disc or belt to condition the surface and blend the finish with the original surface. Product Notes: These wheels use alternate flaps of coated abrasive to quickly remove scratches and blemishes and non-woven abrasive to re-grain the surface. They can be a great time saver. 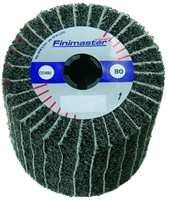 Also Available: For the same machines we also stock non-woven, cloth backed, stripping and polishing brush wheels.